This is the sort of quick and easy brunch recipe that looks and sounds incredibly fancy, but comes together fast! 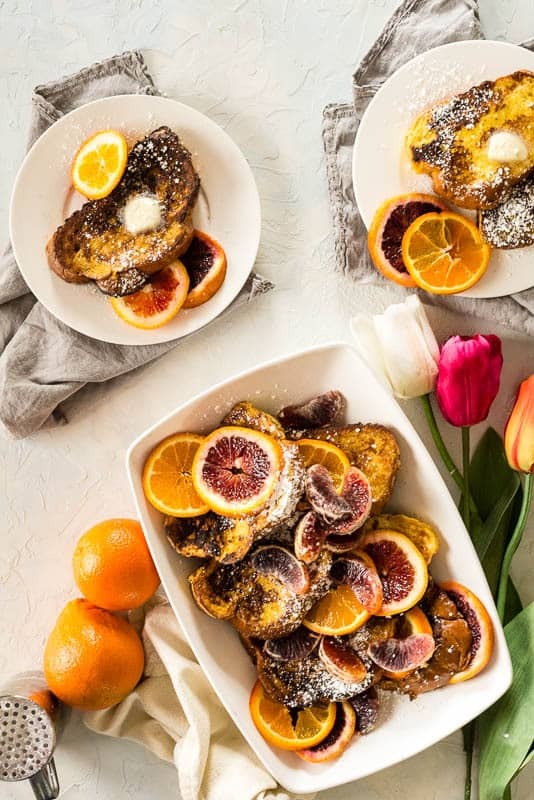 Grand Marnier French Toast is perfect for a special holiday or just because! What happens when you want to dive into a plate of childhood nostalgia smothered in maple syrup and powdered sugar, but also want the fun of ‘adulting’ at brunch? Pretty much an excuse to add some liquor. In this case, just that. I wanted a thick perfect slice of Fench toast and the feeling of a perfect Sunday brunch, mimosas and all. So I grabbed the Grand Marnier and made a theme of it. French toast is best with really eggy bread. Think challah or brioche. Something that already is loaded with flavor. Slice it and let it sit in the air for a few hours before making, so the semi-stale bread absorbs more liquid without falling apart on you. 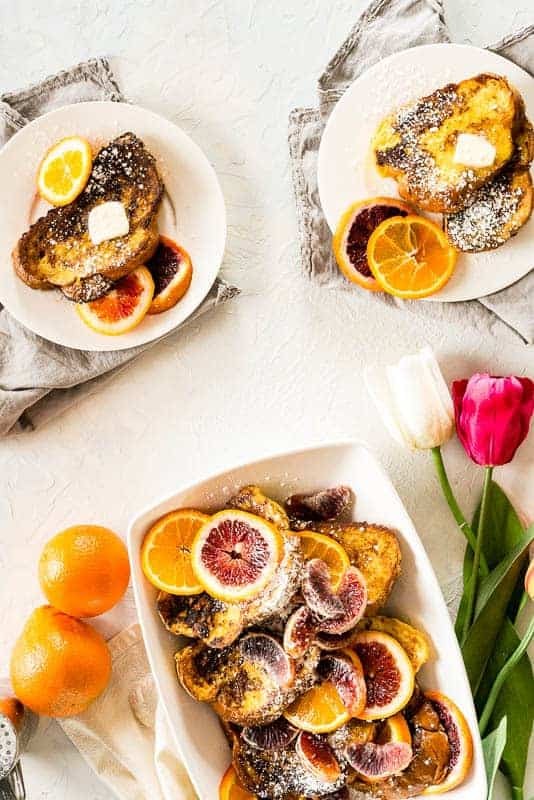 By the time the gang is all over for brunch, this Grand Marnier French toast comes together quick! I cheat and keep my oven on 200 degrees F with an oven-safe dish in there so that I can pop slices in, and keep them hot and fresh, while I chat and toast all of them. So, ready for some more brunch week awesomeness? Maybe a little weekend hurrah? 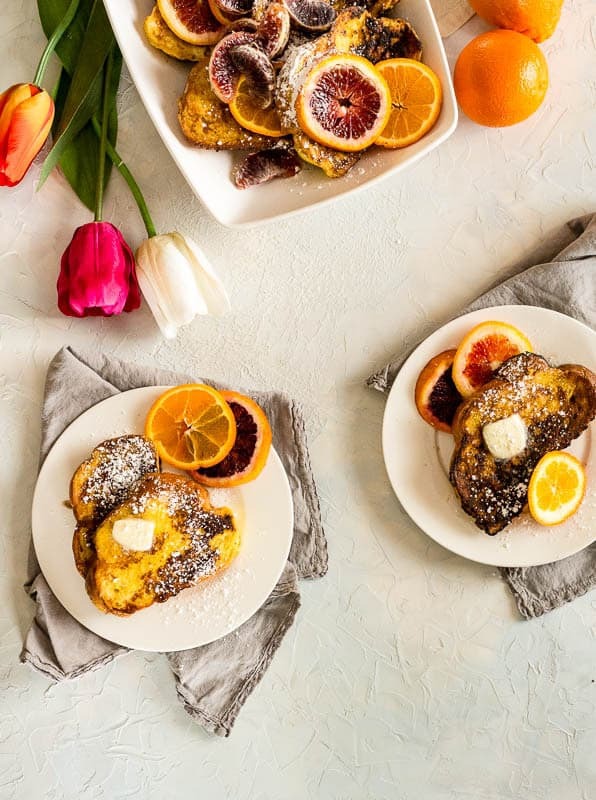 This recipe is fast, fancy and perfect for a Mother’s Day Brunch, or a Tuesday stay-cation, and everything in between. Now for the Grand Marnier French Toast. If you’ve tried my Grand Marnier French Toast recipe or any other recipe on passthesushi.com please don’t forget to rate the recipe and let me know where you found it in the comments below, I love hearing from you! You can also follow along for more good eats and travel tips on Instagram @passthesushi & @girlcarnivore, Twitter & Facebook. Beat the eggs, heavy cream, orange juice, zest, grand marnier liquor, vanilla, and sugar together in a large bowl until everything is well combined and starting to foam a bit. Preheat a large griddle or skillet over medium-high heat. Add a pat of butter to coat pan, keeping more on hand as needed. Soak the challah slices in the egg mixture, flipping to coat evenly on either side. Place the egg soaked challah onto the hot cook surface and toast until golden. Flip and toast the remaining site until golden. Keep the toasted pieces warmed in the oven as you work through all of the slices. Serve with softened butter, warmed maple syrup and a generous sprinkle of powedered sugar. Use an orange emulsion instead of orange juice in this recipe to double down on the orange flavor! 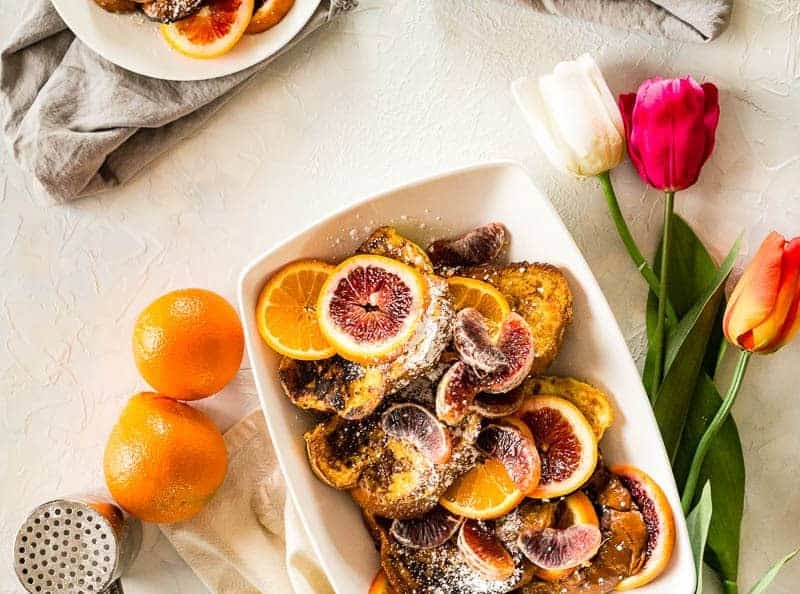 Love the addition of all the different orange flavorings in this French toast. I love French toast but add Grand Marnier? Oh my goodness – it’s got to be amazing. Can’t wait to try it!